The RTI team makes their picks for the No. 7 Vols’ match-up with No. 4 Kentucky this Saturday. Managing editor Nathanael Rutherford and staff writer Ben McKee share their predictions for Saturday afternoon’s game. This is the biggest rematch of Tennessee’s season, and they really, really could use a win in it. The last time these two teams played, the Wildcats absolutely dominated Tennessee in the paint and just embarrassed the Vols. Kentucky was more physical, much more assertive, and played with much more confidence. It was the most shaken I’ve seen UT this season, and they haven’t looked that way before or since. Tennessee gets a big boost thanks to Reid Travis being out for Kentucky. If he was playing for the Wildcats, I don’t know that I’d pick the Vols to win. But with him being out, I think UT’s defense can really focus on PJ Washington down low and and find more space in the paint on offense. The Vols still need to worry about Tyler Herro and Keldon Johnson, though. Herro has been averaging 16.1 points per game on the road for Kentucky, over two and a half more points than he averages at Rupp Arena. Johnson was dynamite the last time the Wildcats faced the Vols, totaling 19 points on 8-of-14 shooting. He made three of his six three-pointers and was a real pain to guard. If Tennessee brings it on defense — which has been an issue this season — then they should be able to win this one. But Kentucky’s defense has been superb, and I don’t expect that to change on Saturday. Travis being out will affect how Kentucky defends the Vols, but I still expect Grant Williams to have a tough time getting a lot of points. The Vols will need their guards to step up on offense and defense both, and they need effective minutes from Kyle Alexander, too. This won’t be easy for Tennessee, but ultimately I think they get it done. I’m going with a VERY bold prediction here by picking Jordan Bowden as the MVP of the game. He’s been in a major slump lately, and he hasn’t made a three-pointer in four-straight games. But I think that his clutch basket against Ole Miss is going to spark him, and I think he showed more confidence in that game even though his shots weren’t falling. I don’t expect him to be the Vols’ leading scorer, but I think he’ll be the difference between them winning and losing on Saturday. In terms of winning the SEC regular season championship, Saturday’s game with Kentucky is a must win. If the Vols are going to claim an SEC title for a second-straight season, they must win out to at least have a share of the SEC Championship. Should LSU slip up and lose a game, the title will belong to Tennessee. But first things first, the Vols have to seek out and capture revenge against Kentucky. This is a difficult game to pick, as the memories of the game in Rupp are pasted in the back of minds everywhere. Tennessee was punched in the mouth, and for the first time all season, didn’t respond. It was the most shocking storyline of the season. 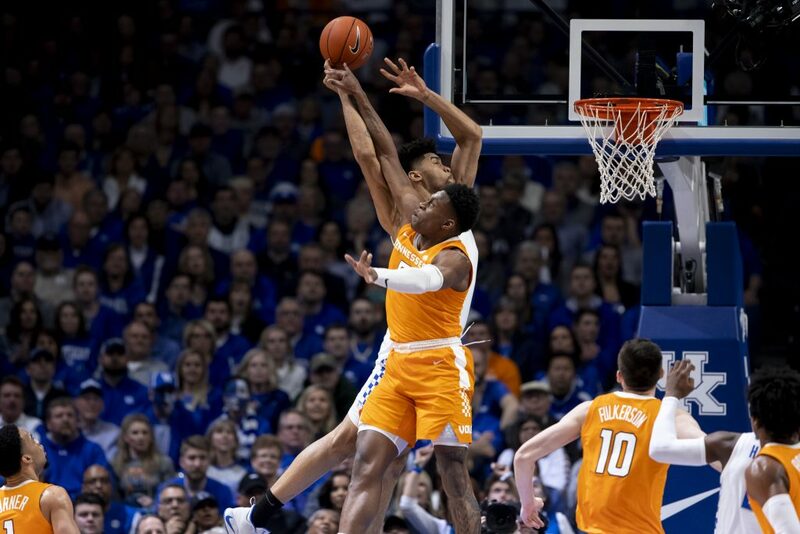 Kentucky was able to punch Tennessee in the mouth thanks to the play of Reid Travis and potential SEC Player of the Year PJ Washington – who has been Grant Williams’ kryptonite for two years now. The duo combined for 34 points on 11-of-16 shooting and grabbed 13 rebounds. More importantly, they were responsible for snatching Tennessee’s soul. Unfortunately for Kentucky, Travis isn’t expected to play on Saturday due to a knee injury, and that will be the difference in the rematch. Against Arkansas in the Wildcats’ mid-week game, the Razorbacks did a tremendous job of zeroing in on Washington and making life extremely hard for him. Travis takes a ton of pressure off of Washington, and without him, I expect for Williams, Admiral Schofield, and Kyle Alexander to have a productive game. The Stanford graduate transfer was brought in to defend Williams. Now that pressure falls on Washington, who is a terrific player, but can’t do it all by himself. The game will come down to Washington and Williams. Both will be productive, but whoever has the better performance, that team will win. I’m banking on the reigning SEC Player of the Year. As I just mentioned, Williams must be better than Washington on Saturday in order for Tennessee to win. I expect for the Vols to make it a priority to get Williams going early on. The junior forward was terrific on both ends of the floor against Ole Miss on Wednesday night, and I expect for that to carry over against Kentucky. After all, he’s the frontrunner for the SEC Player of the Year and a candidate for National Player of the Year for a reason.